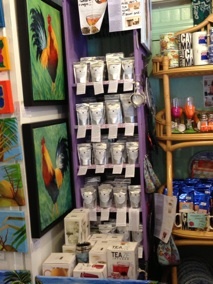 Find a selection of our premium loose leaf tea and teaware at Pure Art. The following items can be purchased: 25g & 50g bags of Go Green, Fresh Peppermint, Workin’ 9-5, Cayman Sunrise, Nap Time, Royal Affair, Guilty Pleasure - Chocolate Mint, Oh Natural - Peppermint, Spice It Up Cayman!, Got the Blues?, Skinny Lemongrass, “One 345” Taste of Swanky, Chinese Tea - Cayman Romance, Hibiscus Vanilla Delight and Beloved Isles Cayman. 25g bags of Cayman Wedding, Silver Needle, Jasmine Pearl and Super Zen.